Pregnancy test kits, also called home pregnancy detection kits or hCG pregnancy tests, are a quick, efficient, and convenient way to determine if you are pregnant or not from the privacy of your home. The test gives instant results by checking for the presence of the pregnancy hormone called human chorionic gonadotropin (hCG) in urine. 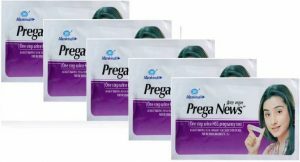 With so many popular options like Prega News, I-Can, and Pregakem on the market, it may be difficult to choose one. Now, we will rank 2018’s best pregnancy tests according to factors like accuracy, ease of use, hCG sensitivity level, and price. In the end, we will also include precautionary tips on how to use these products. 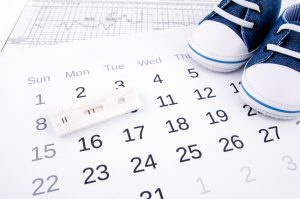 Home pregnancy tests can help you find out if you are pregnant, without you having to reveal the matter to anyone else. Additionally, anyone can buy a pregnancy kit in India without identity proof, regardless of age. This section will discuss all the points you need to keep in mind to select the best home pregnancy test for yourself. Almost all the home pregnancy tests available in India are of a standard format, i.e., they are used after you miss your period. These tests check for a pregnancy hormone called human chorionic gonadotropin (hCG) which is produced soon after conception, and whether a test is positive or negative depends on the hCG levels. All home pregnancy tests measure the hCG levels in your urine in milli-International Units per millilitre (mIU/ml), although the way they are used can be a bit different. Pregnancy tests can be divided into strip types and cup types, and you must choose the type which suits you better. This type of test involves directly peeing on the stick’ by holding the stick in the urine stream and waiting a few minutes for the results. Although more expensive than the indirect type mentioned below, this is considered to be the quickest and most hassle-free type because you don’t need any extra equipment to do the test. These tests are the most commonly available ones and are ideal for those who are afraid of making any mistakes while doing the test. Usually cheaper than the stick test, this type of test involves collecting urine sample by literally ‘peeing in a cup,’ and then transferring it to the test area using a dropper. 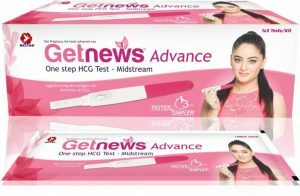 All hCG pregnancy tests have to go through rigorous quality checks to ensure that a standard accuracy of over 99% is maintained for every test that is being sold. Therefore, the differences between the accuracy levels of different brands and test types are negligible. Being able to read and interpret the results correctly is a necessary factor to consider when selecting which home pregnancy test to buy. If you are a first-time user, opt for a kit that clearly marks the meaning of the lined results on the device itself, for easy referral. Individual pregnancy tests are pricey, but many good deals and discounts are available for multi-packs. Bulk buys are also an inexpensive option for women who are actively trying to get pregnant and require monthly pregnancy checks, or those who plan to split the kit between a group of friends. They are also recommended for those who have irregular menstrual cycles and need more than one test to check whether they are pregnant or not. Furthermore, having a few backup kits is a good idea for when an invalid result or faulty test is administered and a second test needs to be taken. 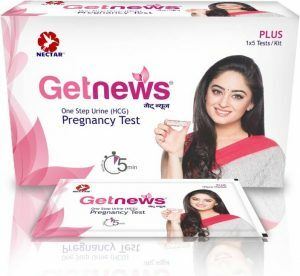 With all these points in mind, we shall now provide you with a list of top 7 best pregnancy test kits you can buy online in India. The products are ranked based on their ease of use, testing method, and value for money. This set of 3 tests is easy to use, gives you results within 3 minutes, and is recommended for infrequent users who want fast results! This pregnancy test is also ideal for women who are looking for a light and portable kit they can carry with them anywhere. However, this is one of the most expensive tests on the list, so if you’re a frequent user, this wouldn’t be the best option for you. Additionally, since this test needs a consistent urine stream sample, if your urine output is minimal, it would not work well for you. Whether you are a frequent user, or you’re buying a pack to share, this test is recommended for you as it comes in a pack of 5 tests! This would also be beneficial for those who have not done these tests before and may need to repeat a few times. Although, this isn’t the best option for you if you’re not comfortable using cup type tests, or are travelling and can’t get your hands on a disposable cup. These tests are also not recommended for irregular users who most likely won’t need 5 tests at a time. These tests are recommended for those who do not like waiting as these give you results within 2 minutes. This set of 5 tests is also great for women actively trying to get pregnant, as well as for those who haven’t done these before and might need a few tries to get it right. If you are an infrequent user though, this test would not be right for you as you don’t need as many at a time. Additionally, this might not be the most convenient test to use while travelling, and we’d recommend choosing a stick type test instead. This inexpensive and easy-to-use cup type pregnancy test comes with a disposable cup! Therefore, this is one of the only cup-type tests you can use even while you’re travelling. It is also recommended for infrequent users who do not need more than one test. Unfortunately, first-time users requiring multiple, repeat tests will be at a disadvantage as these kits only contain 1 test. They’re also not great for regular users because even buying these tests in bulk does not save you as much. 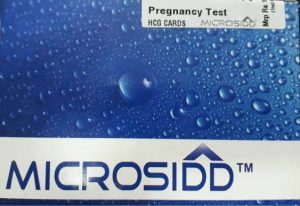 One of the best home pregnancy test kits on the market, these come in sets of 3, with each pack containing 1 cup-type test each. It is an inexpensive option for those who need to do checks regularly or those who would like to share the kit between a small group. It is highly recommended for those who are not comfortable using the stick type tests, as well as for those who wish to avoid making any mistakes. It is also a great product for those who have irregular menstrual cycles and might need to use more than one test. All those looking for an inexpensive set of ‘pee on a stick’ tests should get this product! One of the highest rated products, these come in sets of 6 kits, with each kit containing 1 test each, and give you results within 3 minutes. These would be perfect for regular users who travel frequently and need a hassle-free option! Whether you need to use these tests regularly, or you plan to divide them among friends, these would be great as the cost for each test would come to about ₹57 each! They’re also recommended for inexperienced users or those with irregular cycles as they would need multiple tests. 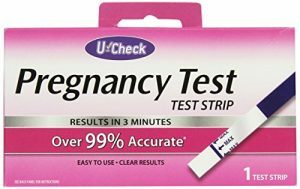 The best home pregnancy test kit on the market, these cup-type tests come in sets of 5 and are the cheapest kits on the market! Since they come in sets of 5 tests, they are recommended for both regular users, as well as those who’d like to divide the tests between friends. They’re great for inexperienced users who want to avoid making any mistakes, as well as for those who are more comfortable using the cup-type tests. They’re also an affordable option for those with who do not have regular cycles and need several tests to confirm their results. Home pregnancy test kits allow women to know whether they are pregnant or not through self-examination, without having to disclose the matter to anyone else. This section will discuss all the things you must remember to take a pregnancy test properly. It is recommended to store unused pregnancy tests between 4° C to 25° C and bring them to room temperature before use. Since temperatures in many parts of India can be quite high during summer, it would be better to keep the unused tests in the refrigerator during those months. You must not store the test kits in the freezer though as they might get damaged and end up yielding incorrect results. It is also important to remember that you always have to bring the tests to room temperature before you can use them. Most pregnancy kits give detailed instructions about when the test can be used at the earliest. However, the instructions are usually only suitable for those who have regular periods every single month. In case of longer, shorter, or irregular menstrual cycles, you would have to adjust the earliest testing date based on your usual pattern. 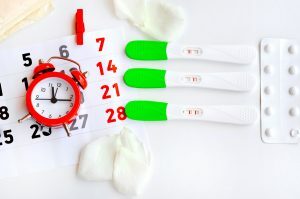 For women who keep track of their menstrual cycles, calculating the expected start date for their next period won’t be hard. However, those who are less aware of their menstrual cycles can use the test after at least 45 days have passed by since their last period started, as this would decrease the risk of getting false negatives. Always make sure you read the test procedure and instruction manual thoroughly before you take a pregnancy test. In addition, it is just as important to check the expiry date of the test to make sure it has not passed its due date and can still be used. One of the major reasons for inaccurate results is incorrect usage, therefore, to avoid this problem you must follow the instructions properly. Although there are only two types of tests available on the market, they both have their own ways of testing, so make sure you read the directions before you use them. An accuracy rate of 99% excludes false results that are brought on by incorrect usage. 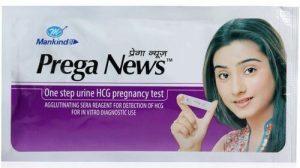 One such example of incorrect usage of pregnancy tests could be taking a pregnancy test before an adequate amount of hCG can be detected in the urine to provide a positive test result. 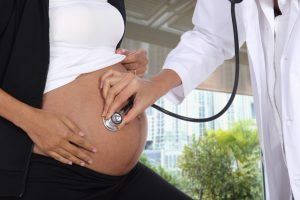 In the event of an abnormal pregnancy, such as an ectopic pregnancy, a false negative result may appear although the person is actually pregnant. Alternatively, a false positive may occur for people taking fertility drugs or other medicines with hCG, or after an early miscarriage where the person has leftover hCG hormones. No matter what the results of the pregnancy test are – positive or negative – the next step is to consult a doctor for a final diagnosis. When in doubt, only a medical professional can confirm whether you are indeed pregnant or not. If the test is positive, you should meet with a gynaecologist to discuss what you would like do next. Pregnancy tests allow women to check if they’re pregnant or not while keeping the matter private. Such tests are also great as they can be used anywhere to get immediate results. 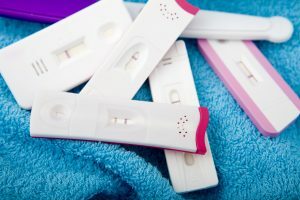 We hope this article has helped you decide what type of test would be best for you, and you were able to find a suitable home pregnancy test kit for yourself.